The top is mirror veneered with superbly figured rosewood with a turned moulding, leading down to a veneered frieze and further turned moulding. The central column is veneered in fine quality rosewood, supported by a carved rosewood stylised tulip design with a turned and moulded collar below. This leads down to a rosewood veneered tri-form base with a turned moulding, supported by three scroll brackets terminating with lion paw feet. 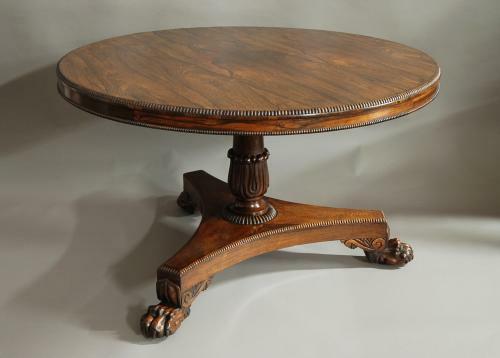 This table could be used as a centre table or dining table etc and also has a tilt top. This piece is in very good condition, stable construction and can go straight into a home.